features the use of multiple colors to create a rainbow effect. You can also make it with a solid color, if you want it to be more elegant. 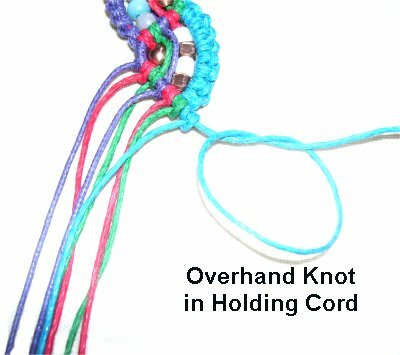 This is a good Macrame project for beginners who have some experience with the knots used in the bracelet design. This Bracelet design can be confusing, so make sure you know the difference between holding cords and working cords (visit the Dictionary if you don't). The cord lengths indicated below include color changes on the right and left edges (step 8). You must swap cords, or 2 will become too short. Keep that in mind when choosing materials and arranging the colors. Cut 3 cords, each at least 2.5 yards long (for sizes up to 7.5 inches). For bracelets more than 7.5 inches, cut the cords longer. 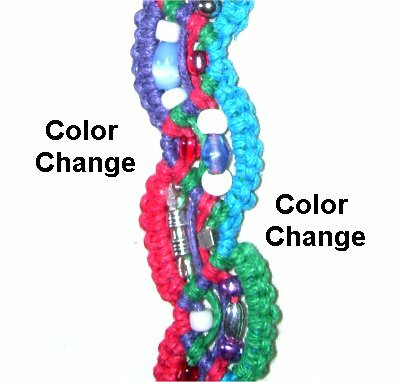 Prepare the ends with glue, if you plan to add beads to your Rainbow Wave Bracelet. Locate the center of the cords by matching the ends. Arrange the cords vertically, placing tape over them to mark the center. 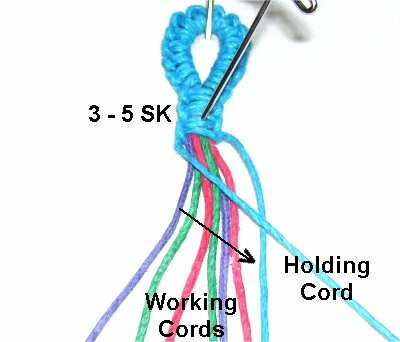 The 3-yard working cord used for the clasp should be placed to the right of the other three. 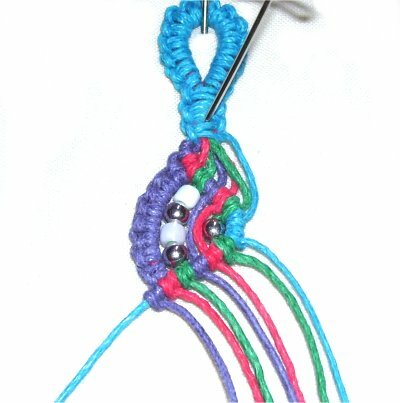 In the following images for the Rainbow Wave Bracelet, that's the blue cord. 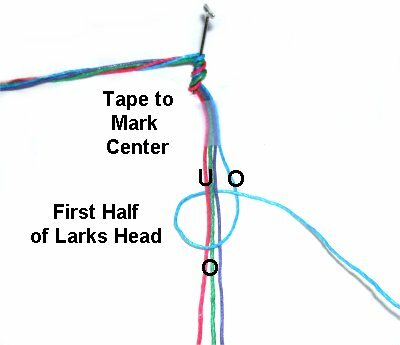 Step A: The first half of the vertical Larks Head knot is tied with the working cord, onto the other three. Rotate clockwise, passing over - under - over as shown. Tighten the first half firmly, so it rests against the tape. 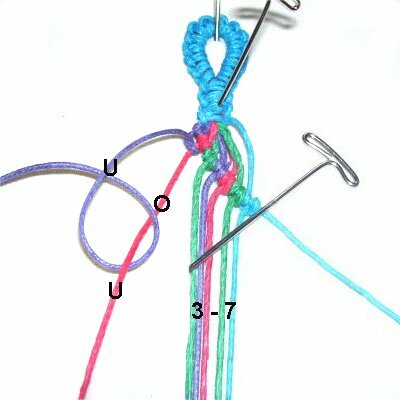 Step B: The second half of the vertical Larks Head knot is tied under - over - under as shown. 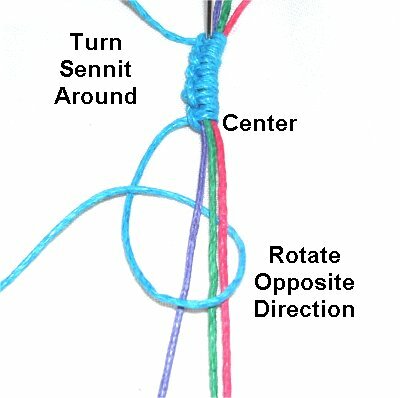 Tie a total of 6- 10 Larks Head knots, so the sennit is approximately 1.5 times the size of the button. 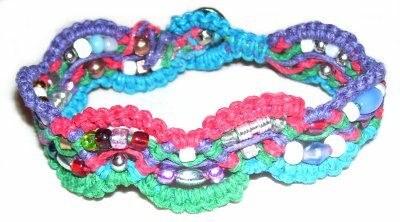 In the Rainbow Wave Bracelet shown, the button was 1/2 inches in size. So the sennit was 3/4 inches in size. Turn the sennit around to make the second half. 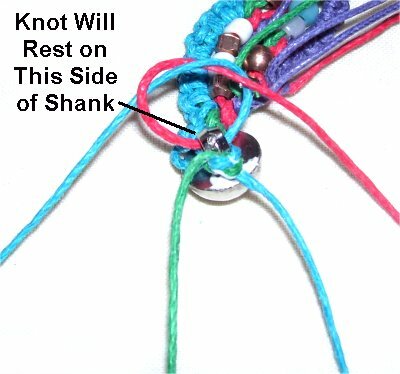 Since the heads of the knots are on the left, you need to tie the Larks Head knots counter-clockwise. 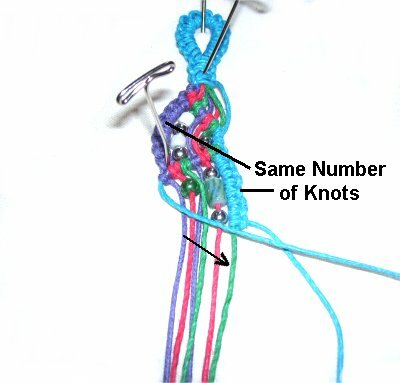 Tie the same number of knots as the first half, starting at the center. 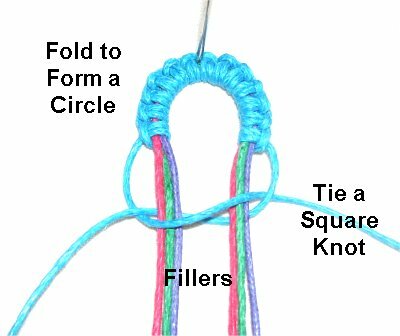 Fold the Buttonhole Clasp design to form a circle. Hold it together and check that the button will fit through it. Add more Larks Head knots at each end if needed. Arrange the colors now, in whatever pattern you prefer (fillers). 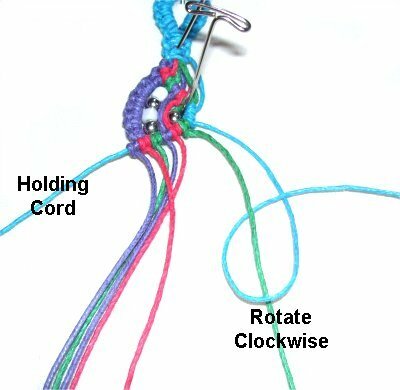 Use the two working cords to tie a tight Square Knot around all the others. Tie 2 - 4 more SK, keeping the filler cords in the positions you chose. You can still make adjustments to the order after the SK are tied, but it's easier to do it now. Step 1: Mentally number the cords. Move cord 1 to the right. 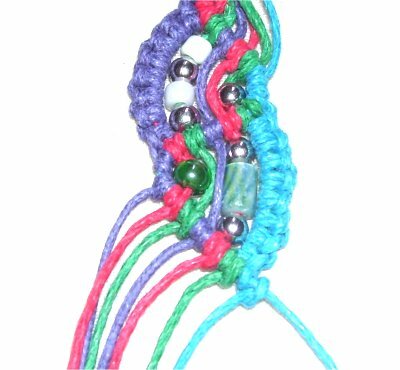 It will be used as a holding cord, through the entire Rainbow Wave Bracelet design. Secure it so it's taut. Attach each of the remaining cords to it with a Double Half Hitch (DHH). Progress from left to right. Rotate counter-clockwise as you tie these knots, and tighten each one firmly. 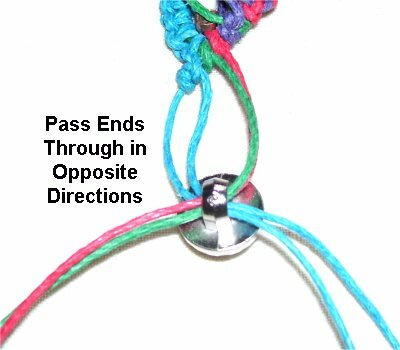 A Half Hitch is tied over - under - over as shown. 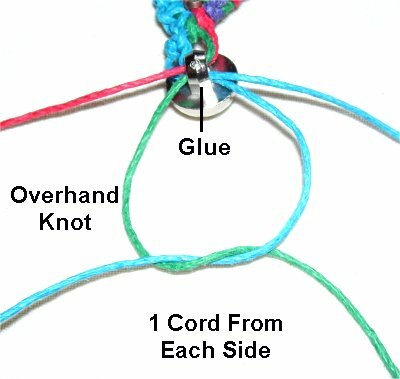 Tie a second knot to make a Double Half Hitch. 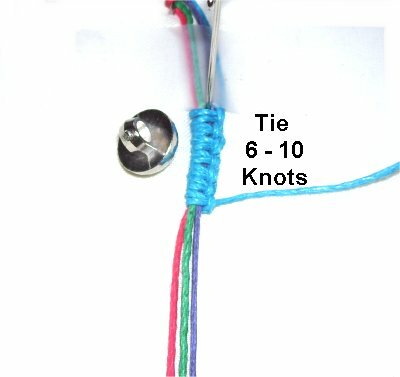 Step 2: Place a pin next to the last knot tied, and move it as needed, until it's the same angle as the first row. When you find the proper angle, push the pin through the board. Mentally number the working cords 1 - 7. Separate cords 1 and 2, which are used next. Step 3: Use cord 1 to tie several Larks Head knots onto cord 2, rotating counter-clockwise. 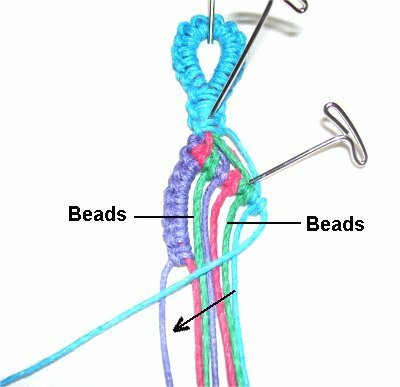 This is the same knot used for the clasp for the Rainbow Wave Bracelet. Step 3, continued: Tie enough Larks Head knots to reach the place directly across from where the pin enters your board. In most cases that will be 6 to 10 knots, depending on the angle. Step 4: (Optional) Attach beads to cord 3, which is next to the Larks Head sennit. 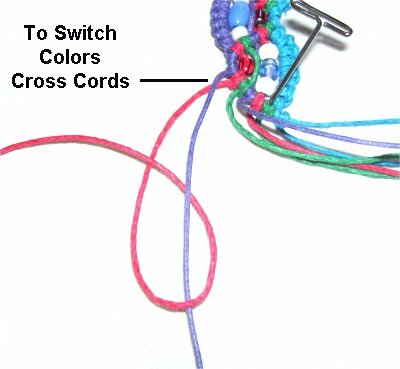 You can add more to the other cords, but make sure there's only 1 or 2 small ones, so they fit inside the triangle shape. Move the holding cord to the left and secure it so it rests against the bottom the Larks Head sennit. Attach the working cords to it with DHH. Move right to left as you progress, and tighten the knots firmly. 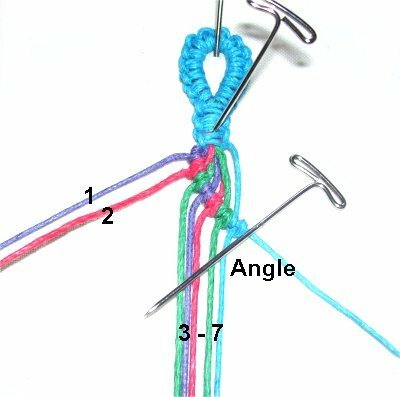 These knots should be tied in a clockwise direction. 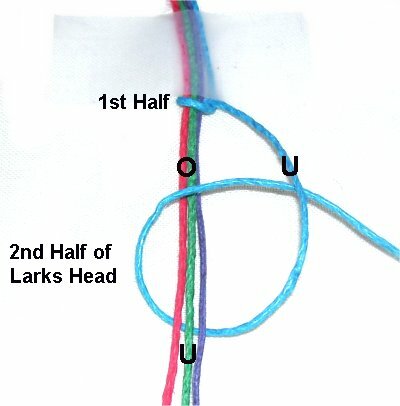 The Larks Head sennit and the portion of the cords inside the triangle should be as straight as possible. Step 5: Repeat step 3, using working cord 7 to tie the Larks Head knots onto cord 6. 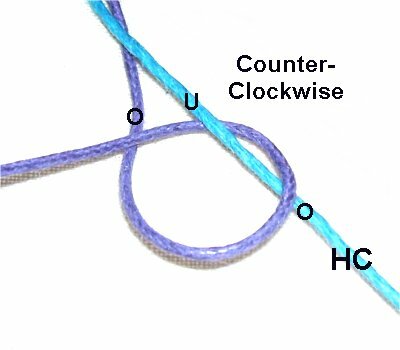 These knots are tied in a clockwise direction. Tie the same number of knots as on the other side, so the angle will be the same (see next image). Step 6: Move the holding cord to the right and secure it so it rests against the bottom of the Larks Head sennit. Attach the working cords to it with DHH, moving left to right. Here is a closer view of the first two triangle shapes. Step 7: Repeat steps 4 - 6 several times, to create the rest of the Rainbow Wave Bracelet. Important: Cords 1 and 7 will eventually become too short to be used as working cords. You need to switch them with cords 2 and 6, which will change the color of the Larks Head knots. Swap the cords before you tie the Larks Head Knots (step 3). You can switch after every triangle shape, or in some other pattern. 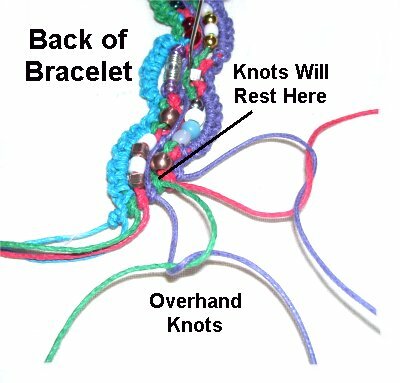 Just make sure the Rainbow Wave Bracelet design is balanced. Step 8: To switch, cross cord 2 under cord 1 on the left, and then tie the Larks Head knots with cord 2. 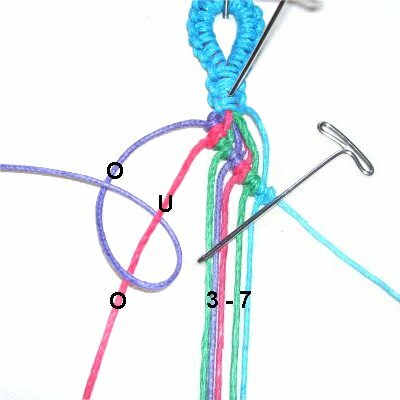 When you work on the right side, cross cord 6 under cord 7, and then tie the knots with cord 6. Step 9 : When the Rainbow Wave Bracelet is the size you want, tie an Overhand Knot with the holding cord. Position it so it rests next to the last DHH tied, and tighten it firmly. This prevents the working cords from sliding down. Turn over the bracelet so you are working in the back. Select 4 cords to be finished off now. It doesn't matter which ones. Using two cords, tie tight Overhand knots. Arrange the knots so they rest against the row of DHH closest to them. Apply glue to these knots and allow it to dry completely, before cutting off the excess material. Step 10: Pass two of the remaining cords through the button's shank. Do the same with the other two, heading the opposite direction. Tie an Overhand Knot with one cord from each side. Apply glue next to the shank, so the knot will rest on it once tightened. Make sure this knot is as tight as possible. When the glue dries, cut off the excess material. Use the remaining two cords to tie a second Overhand knot. It should be arranged so it rests on the other side of the shank. Apply glue and tighten firmly. Use a clip to hold the cords in place while the glue dries. Cut off the excess material. Have any comments about the Rainbow Wave Bracelet? Contact Me.